The Climate Plan constitutes the most comprehensive and effective response to the danger of runaway warming. It contains multiple lines of action that are best implemented as soon as possible, simultaneously yet separately (in parallel), and with a preference for local action, with obvious benefits for the environment and for species threatened with extinction. Besides this, the proposed action will also save people money, will improve people's health and safety, will increase security of food and fresh water supply, will make energy supply and the electric grid more efficient, safe, robust and reliable, will reduce perceived needs for military forces to police fuel supply lines globally, and will create numerous local job and investment opportunities. At first glance, one might think that, given the lack of action on climate change, any regulatory action may seem welcome. Nonetheless, if we have a say in the matter, why not advocate what we believe are the best policies? The Climate Plan blog offers opportunities for people to join the calls for effective and comprehensive action. Feebates typically are the most effective way to achieve the necessary shifts, and they generally are best implemented locally. Some lines of action may require a more international approach, which is particularly applicable to the management of surplus heat that has been built up over the years, as illustrated in the above image under part 2. Importantly, for a climate plan to be both comprehensive and effective, these different parts and each of their associated lines of action should be implemented simultaneously. A carbon tax is more straight forward and effective than cap-and-trade or standards. Since sales taxes are quite common, a carbon tax can often be implemented in the same way, i.e. added as a percentage and collected alongside existing sales taxes. However, the name carbon tax is somewhat confusing, since a comprehensive climate plan should cover more than just carbon dioxide. The term tax can also be a barrier for many who fear that tax money may be wasted within a government bureaucracy. Also, the effectiveness of policies could be further increased by earmarking revenues for specific purposes that help combat climate change. This makes the term 'fees' more appropriate than 'taxes'. Finally, rebates typically are the best way to help clean products increase their market share. In conclusion, the most effective way to make the transition to clean products is by implementing local feebates, i.e. combinations of fees and rebates. In each case, a local feebate will facilitate the transition from specific polluting products to clean alternatives, by imposing fees on sales of the polluting products as a percentage of the price, while each time using the revenues exclusively to fund rebates on products that are both sold locally and constitute clean alternatives to the polluting products. How are local feebates best implemented? For reasons of accountability, it's best for revenues to go into a Feebate (Trust) Fund under federal authority, but as long as sufficient progress is made to combat climate change at state level, administration of feebates within a state can best be handled by the respective state. States can thus to a large extent decide the level of fees and support, as well as what mix of policies they feel will work best where. Where such progress is lacking, the federal authority can resume control and decide to direct (part of) revenues to federal programs, such as construction of high speed rail tracks that cross state borders, biowaste management in national parks, federal research grants into ways to combat climate change, etc. Local feebates, is that all we need? An important part of the plan is the possibility that federal government could resume control over the revenues of fees collected within a state. This will help get all states on board. The same applies where states delegate their authority to local councils, i.e. it encourages local councils to take effective action or else state fees with be imposed with revenues used to support state projects that help combat climate change. One would think that it is obvious for countries to agree to support the most effective ways to make the necessary changes. In addition, the way the plan works allows a maximum amount of flexibility for each country to implement the policies they want, on the premise that each country does intend to make genuine changes domestically (as opposed to seeking to source out their responsibilities). To ensure that each country does make the necessary changes, sanctions could be included as part of international treaties on trade. Such sanctions could be quite simple to implement, e.g. where a country fails to take effective action, countries that export products to such a country could impose fees at the border and spend the revenues at their own discretion. 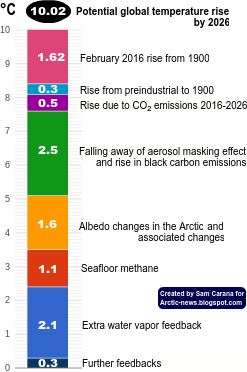 Internationally, action is also needed to reduce the impact of shipping and aviation, while it is furthermore necessary to reverse ocean acidification, act on the threat of methane releases from clathrates, etc. Given the international nature of such issues, feebates may seem less applicable and there may seem less need to delegate the implementation to local levels. Yet, the concept of feebates is helpful, as it can overcome budget concerns, while it can also enable many operational decisions to be taken at the local level where the action is to be implemented. As an example, where sufficient funding is lacking, fees could be imposed on international flights (in addition to the fees on fuel and airplanes that are part of the feebates discussed above) and the revenues could be applied directly and exclusively to support such international causes. International agreement on what action is needed and how funding can be raised can do a lot to help speed up implementation of the necessary action at local level. Some potential action will need sufficient research to be done, to avoid that action by one nation could have negative impact on other nations. In such cases, the Climate Plan calls for supervision of the U.N. (see top image). This Climate Plan offers a great amount of flexibility for each individual country to choose the policies they want, and in fact recommends countries to delegate the action to states and local level. This, and the effectiveness of the proposed policies make that this Climate Plan has a good chance to become widely accepted across the globe. In other words, the Climate Plan does not prescribe feebates, it merely recommends feebates, for a number of reasons. The Climate Plan intends to follow implementation of feebates around the world, in an effort to share experiences and thus help anyone find attractive ways to accomplish the necessary shifts. Feebates can be implemented in budget-neutral ways, while the administrative framework is already in place, i.e. implementation can take place on the back of sales taxes, vouchers, tax returns and other policy instruments that are already commonly used all over the world. Their effectiveness can make that feebates can accomplish the rapid shifts that are necessary in the light of catastrophic climate developments that will take without action. More discussion of the benefits of feebates can be viewed at the blog at feebates.blogspot.com and the Action Plan is also discussed at this page and this post at the Arctic-news blog. Once more, if we have a say in the matter, why not advocate the policies that works best? While Earth as a whole is experiencing global warming, warming in the Arctic is taking place much more rapidly. 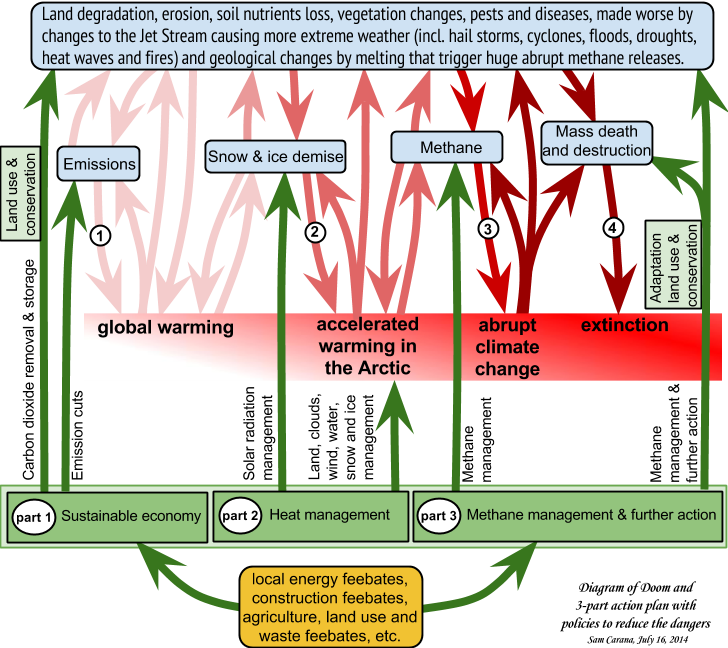 Accelerated warming in the Arctic threatens to destabilize methane stored in the form of hydrates and free gas in sediments underneath the Arctic Ocean, in a vicious spiral triggering further methane releases and escalating into a third kind of warming: runaway global warming. The risk that this situation poses is intolerable, as further described at the Feedbacks page. For more details on the necessary action, view the Action page, and for more details on recommended policy, view the Policies page. You are encouraged to share this post and the images widely. You can also announce local action in line with the Climate Plan at facebook.com/groups/ClimatePlan and invite people to join in your local area. Just by joining that group, celebrities, politicians, economists and scientists could make an extremely helpful contribution. If you like, you can also send a message privately to facebook.com/SamCarana to discuss things. Thanks for reporting the problem and actionable ideas for remediation correction. Look at the 9Km ring of trees being planted around and planned to encircle the sahara. Make urban buses fare-free. This will end sprawl and growth. No bureaucracy. Available right now. Tested. In addition it contributes to falling birth rates. Easy to sell to city govt, since it actually saves money by reducing car externalities. This is such an excellent site. I'm reading all the pages, and I'm amazed that so much has changed since I looked into all of this so many years ago. 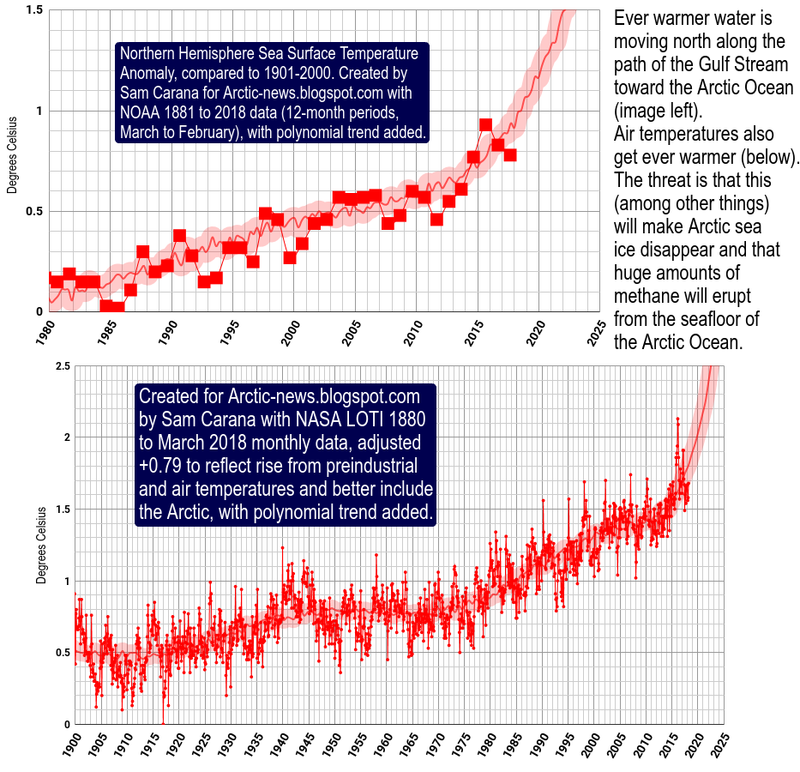 I was alarmed then, seeing the data that the artic ice was melting, at the time, ten times faster than the models had estimated. That made me think things were far more dire than was generally understood, and now I see that was an accurate assessment. Please keep up the site, please continue to inform. Probably more eyes are seeing it than is apparent. I will pass on the information to my senators and house representatives, although given the state of political will and corruption in the US, I don't expect much from them. I don't know what it will take to wake people up. What would you suggest an individual do to get action at the local level? 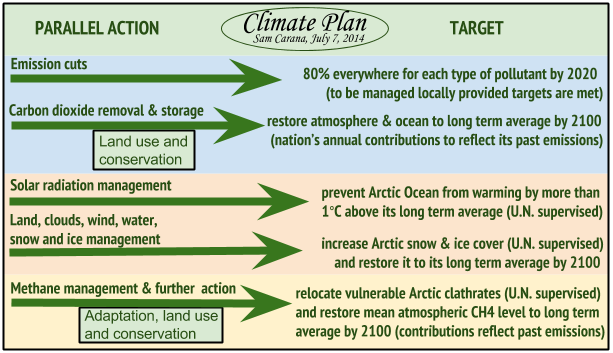 Support the Climate Plan, which has a local focus and can be implemented now.